I had many feed back regarding the siphon design on usage of smaller funnel inlet to the stand pipe. My standard design make use of 50mm ~ 25mm reducer as illustrated below. I decided to redo this valve with 40mm ~ 25mm reducer as shown below and see how it goes. Its still too early for me to say whether its working without problem but so far the result is positive. With this reduction to the stand pipe inlet size it will then be possible to reduce the overall size of this valve and still maintain the same siphon muscle to the growbed. During initial testing of this smaller size inlet, I found that it needs more inflow of water to create the siphon this in effect could reduce ranges this siphon will work. What I suspect is as you are nearing the stand pipe size in this case 25 mm more inflow will be needed to create a siphon. 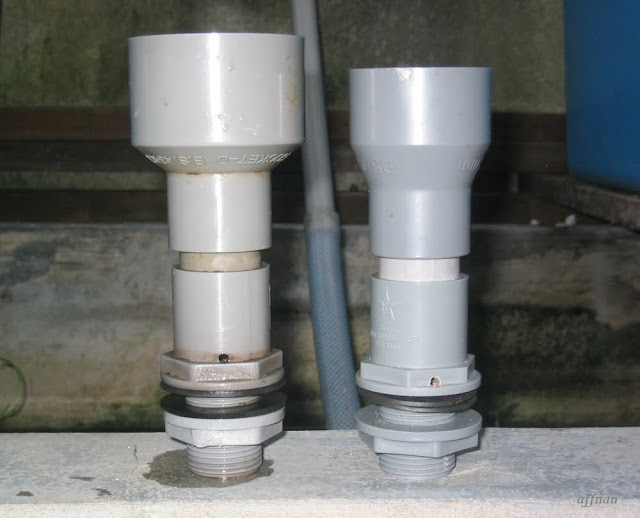 Photo above is the standard siphon on the left with the reduced inlet on the right, both these siphon is identical in its size with only difference is the reducer used. Photo below for the standard siphon from top, with water overflowing and down the 25 mm stand pipe. Photo below is the 40mm inlet siphon, note that the bell and strainer pipe is still using the existing which is for the 50mm inlet siphon. I will need to fabricate entirely new bell and strainer to ensure it is better matching the smaller inlet diameter. I turn one of my growbed into a testing bed for the siphon, it work just fine. 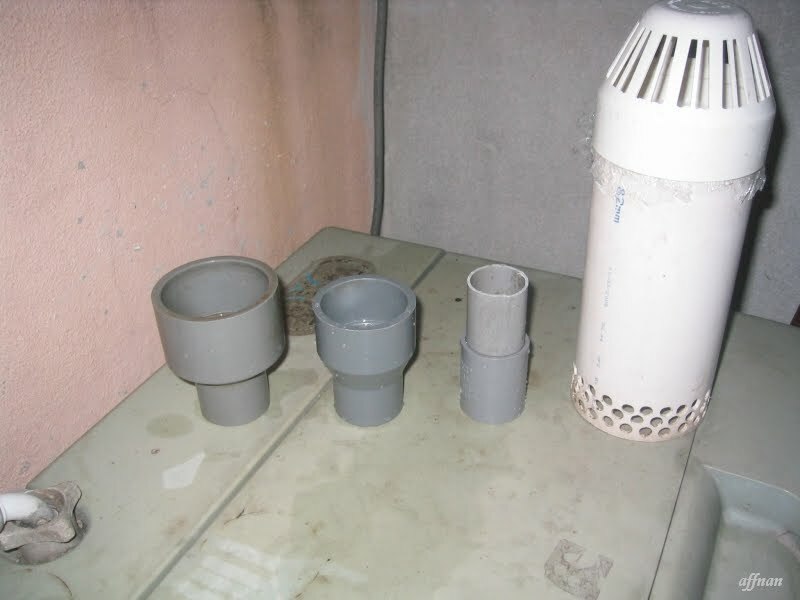 Proper size pipe needed for the bell, ideally the bell pipe should be about 70mm but this tube size is not available so I settle with 82mm sewage tube which is smaller in diameter than a 80 mm pvc water pipe. More testing need to be done, I should make a siphon tester next. Doing test on growbed is just too risky for the plant. The 82mm sewage tube I use cling wrap plastic to seal one end making the bell, I could not find an end cap for it. I did a quick comparison test on the revised siphon on my home kit. 25 mm stand pipe extender - straight stand pipe. The test did was a simple siphon starting time using stop watch. The stop watch is started as soon as over flow is detected from the siphon outlet and stop when full flow occur. Time taken will be the siphon starting time at same water inflow for all the different setup. Photo above is the full flow of the siphon. BTW Siphon outlet can be like this with slight restriction if you choose not to use the elbow type. Tabulated below are the results of this simple test, and it may change the way how I make my future siphon. As you can see from the above, time taken for siphon to start reduce significantly from the bigger diameter to the smaller diameter pipe. It took 55 seconds to start a siphon for the stand pipe using 50~25mm reducer down to about 5 seconds it take for the straight stand pipe. However on the 25mm straight stand pipe, siphon do not reset causing the dreaded equilibrium flow. 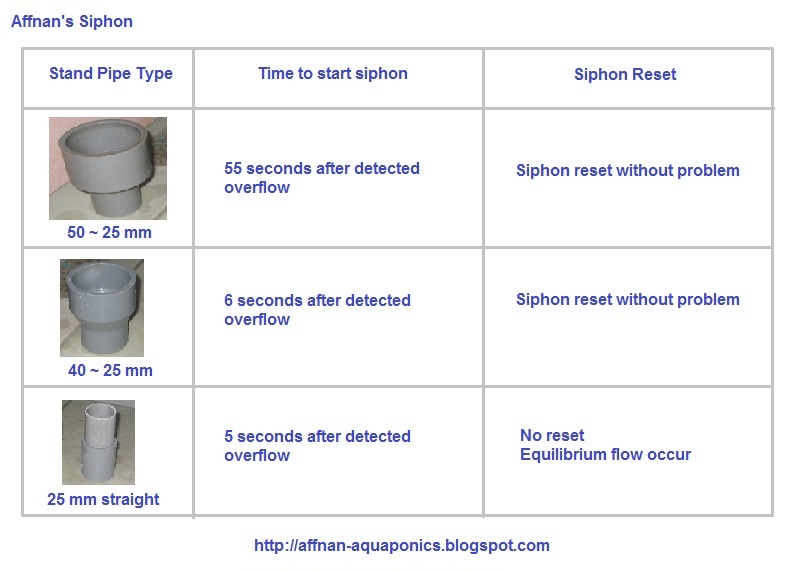 The above short test clearly show the 40~25mm reducer siphon is the best option in this situation. 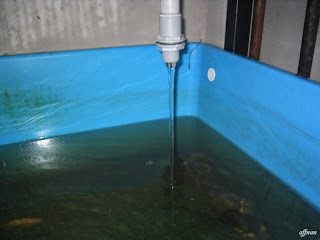 Above is the equilibrium flow, water continuously flowing out the growbed non stop causing the low water level phenomena. Apart from causing this, the straight stand pipe also has an almost silent down flow with minimal water disturbance or noise as compare to the stand pipe using the reducer as below. 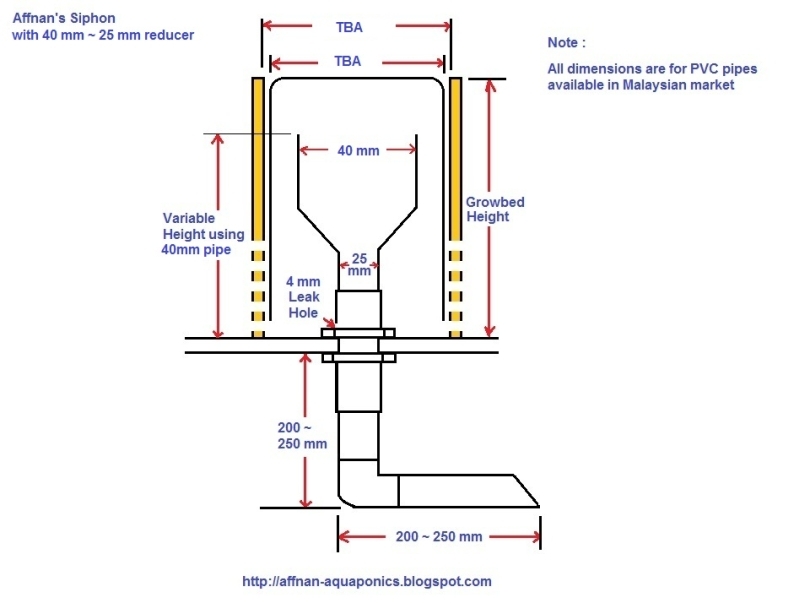 I will do more test, to check which siphon will deplete the growbed water more and what effect does the outer bell size has on the siphon effectiveness. I am changing the siphon sizes to make it more efficient and better reliability. However this is still to soon for me to make any concrete statement on the smaller size funnel usage. It does looks good, so I am retrofitting one growbed with this size siphon. No luck today, hardware store here don't stock 65mm PVC pipes and fittings. They say there is no demand for such size. Being an uncommon size I am reluctant to include it in my siphon part list. Instead of getting the 65mm pipes I bought three 32 x 25 mm reducer to try out. Photo below show it along side the 40 x 25 mm reducer. I am testing it now, so far so good no equilibrium flow. I am thinking of making my valve kit available for those that have difficulties in getting the correct size fittings to make their own. Since all 3 sizes will work with my standard valve size i.e the bell and strainer pipe. I think why not include all three reducer in the kit, this way user can try out which one is best for their setup. It going to cost extra but not by much. So if I homemade siphon kit as below and make it available worldwide will people want it ? Include all these three reducer in the kit, it should very much cater for most people needs. After a lot of testing, assessment on parts I found that the viable improvement on the siphon design is to reduce the funnel size by using the 40x25mm reducer without any other changes to the initial bell size. This will allow user to use various sizes of reducers as shown above while maintaining commonality across the design of the 25mm size variant. On variant that use 15mm or other size you just have to use reducer/adapter funnel size and bell size to suit your installation. The principle concept and design of this design remains unchanged only slight alteration to its dimensions due to parts differences at different locations. Siphon outlet for high water level is completed and can be view here the completed work. Simplified diagram as below. This is a diagram of the revised siphon, material use are estimate base on industry stand PVC pipe available in the market here. I need to check local hardware store this weekend to get all the sizes mentioned below. 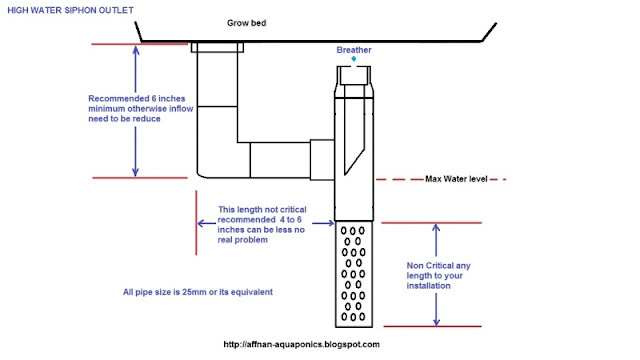 There will be a limit to how small a siphon can be made to work with average size grow bed. One thing that we need to take into account is maintenance. 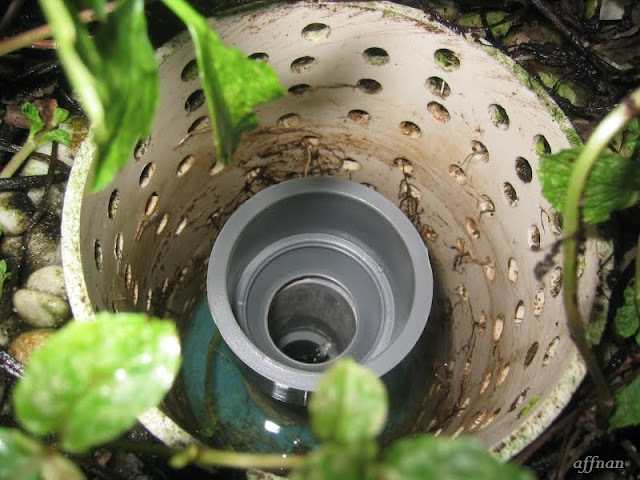 If the siphon is made too small then it might make it prone to clogging by roots growth and it could also be difficult to clear it of root growth due to limited access. 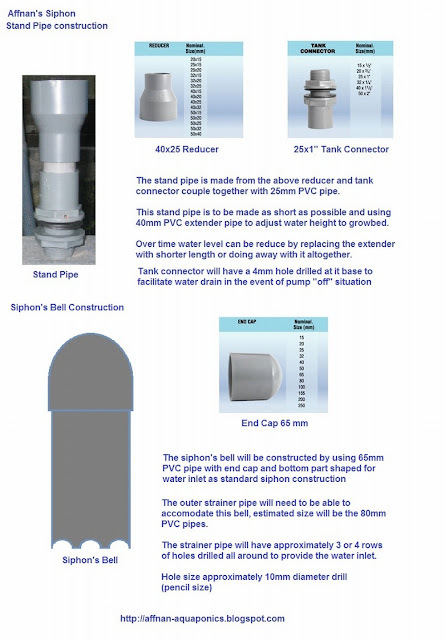 Due to non availability of the 65 mm pipe, all siphon dimension are the same on both the 50 mm and 40 mm reducer type. They can be use in same installation by just replacing the adapter part, I have use 40mm adapter for more than a few months without any problem. Tahniah, Affnan's Siphon keluar dalam Backyard Aquaponics Mag Edition Nine. 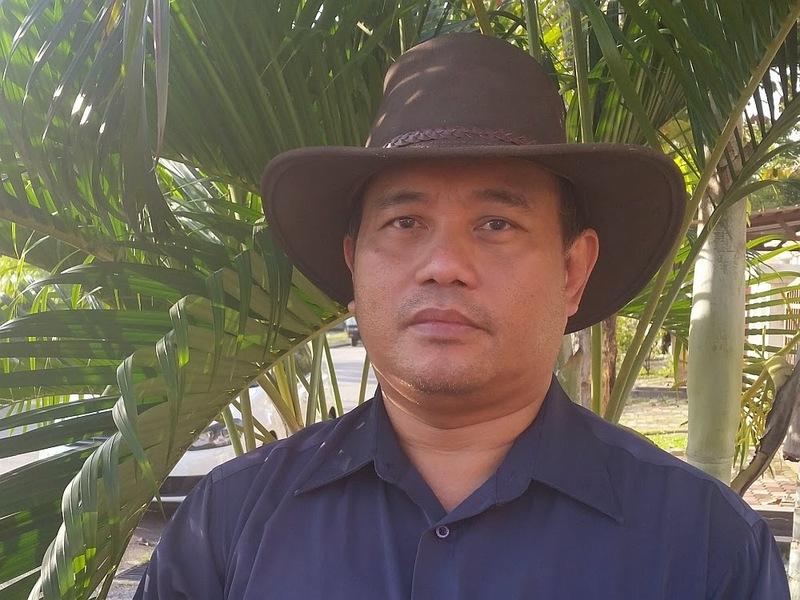 Satu sumbangan untuk industri aquaponics. Terima kasih, PB .. harap dapat perkembangkan di tanah air sendiri. Thanks for the explanation and very good diagrams of your siphon model. 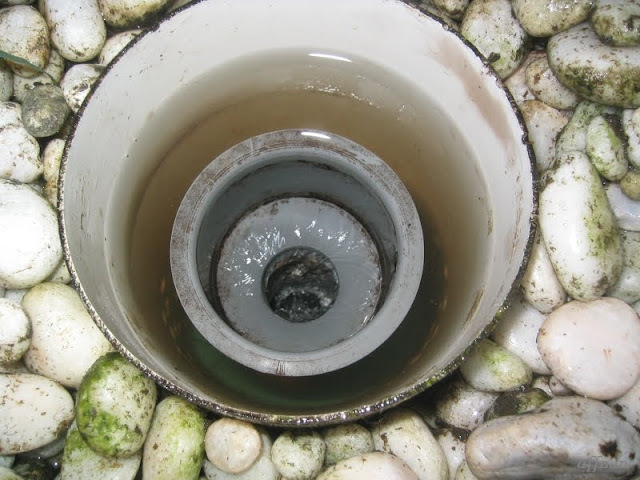 Have you tried adding a leak hole closer to the top of the straight pipe, maybe 1 or 2 cm's below from the reducer? I got a smaller size reducer and could not get the siphon going, so I drill a hole to increase the volume of water flowing into the main pipe to get suction going, this fixed it and my siphon works every time with a smaller reducer and more grow bed space. Thank Mario for the info. I never need to have drain hole higher. Only reason for it is to drain water from gb during pump off. Having it higher would make it hold water during pump off at that level. However if its make it work for smaller reducer then great news, this increase its reliability with difference specification. I did tried reduce 32mm ~ 25mm it work without problem, important feature of the reducer is, it should have a funnelling slope to do the reduction smoothly otherwise it may reduce the efficiency of these siphon. I'll test out.. the higher drain hole. What is the purpose for the siphon? why don't we use a direct flow out instead of using siphon for the grow bed? 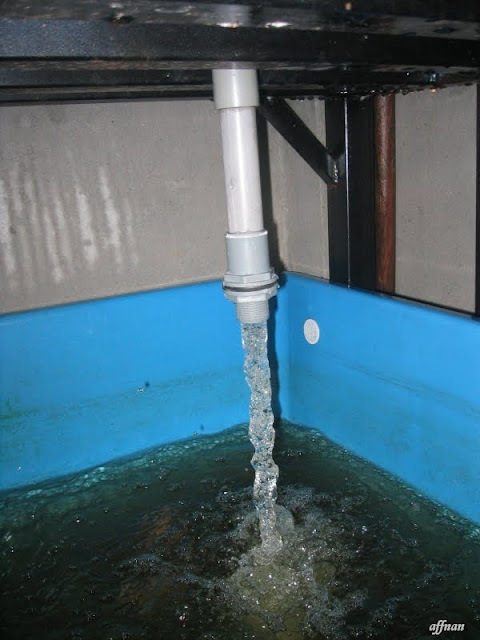 LL, in Aquaponics we need to constantly wet and aerate the growing media to get the Bacterial process going, a siphon facilitate this process. There are other ways to get it done, using a siphon is one of the way. 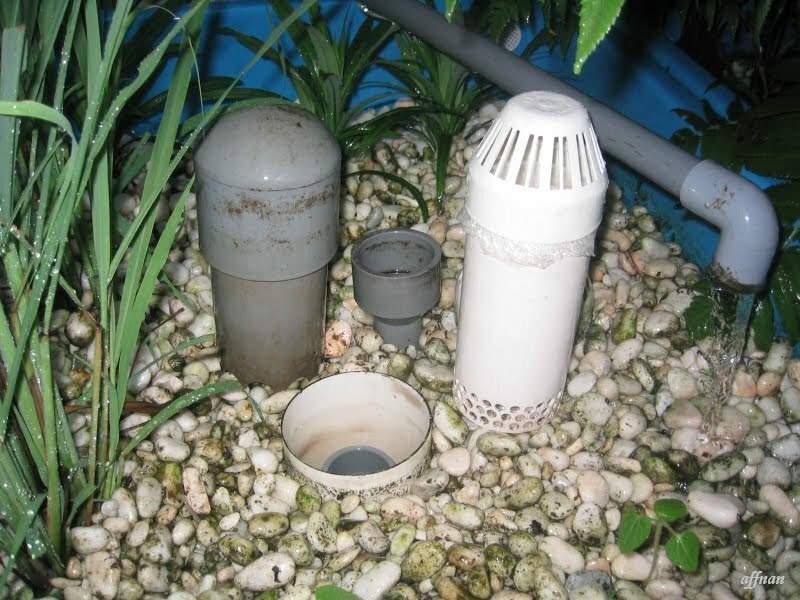 Im new with aquaponics and i just setup me blue barreponics, im confuse with the bell siphone could you lend me your expertise the exact measurement of the assembly of the bell siphone, if you have some time please email me otep_josephdano@yahoo.com, Thanks and more power to you. I'm new to Aquaponics and need some assistance. Gostei muito das explicações, esse blog é ótimo, a melhor explicação sobre o sifão foi aqui, estou começão a montar o meu, já fiz o laguinho com 3500 litros, quero criar carpas ornamentais e aproveitas as verduras para consumo próprio, ótima oportunidade para virar vegetariano, kikikikiki!, só assim para sair um pouco da internet, abraços e obrigado pelas explicações. Selamat malam Affnan and thank you for a wonderful blog, what a great resource! Been a while since I have been to Malaysia, I used to be stationed in Singapore 1980-83 whilst in the New Zealand Army. 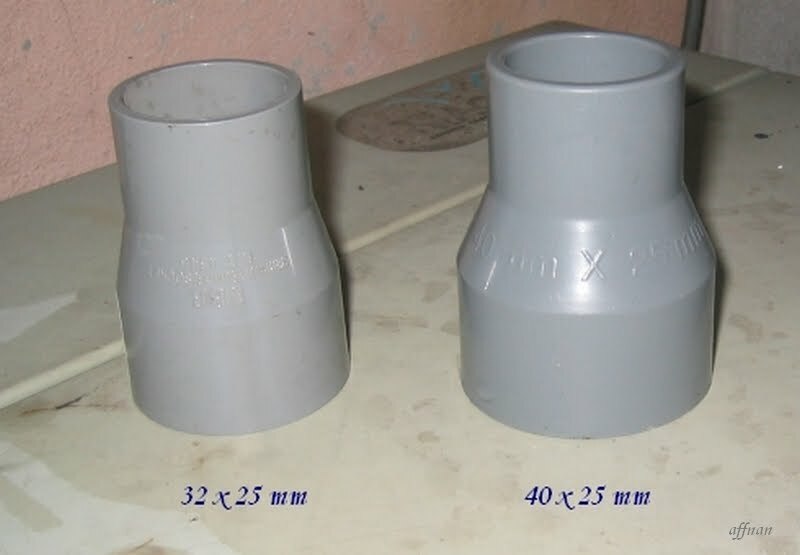 I was wondering if the stand pipe can be made from 32mm waste pipe as the 25mm HP pipe and fittings are very expensive here. 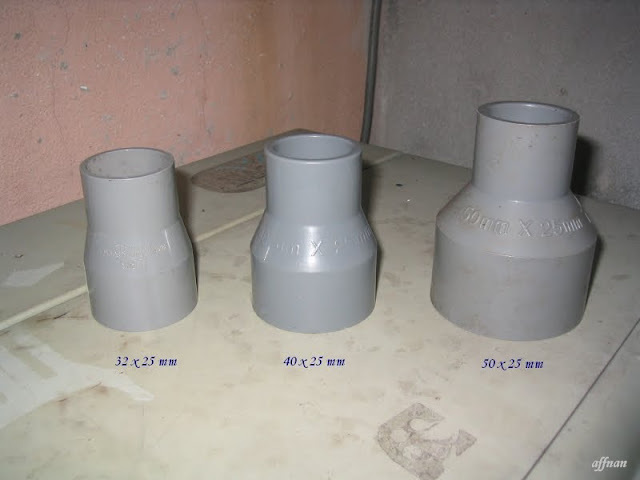 32mm waste pipe its not a problem only need to take into account that it may need more inflow. But it should work, make a funnel shape on the end, you are set. However do test it out first. Many changes since 83 over here, I had been to many countries but still not manage to get to way down under New Zealand, that one beautiful place that I must take my family for vacation. Thank for the quick response Affnan. I really miss Malayan Makan. I'm only in the planning stage and will let you know how I get on. Hey Affnan, love the website and all the info. During your testing was there in difference in performance between the 80 mm bell and the 65 mm bell while using the 40 x 25 reducer? You say due to the unalaiability of the 65 mil it is okay to just use the 80 mm bell with the 40 x 25 reducer. Though the 80 mm may work, is the 65 mm superior and preferred if you have access to it? Thanks! Do I have to have a bell siphon? I was thinking about using a floating device... but then again are floating devices only for certain plants? what do you recommend? Hi, thanks for your comment. It's difficult to recommend exactly on each indiviual setup. Siphon are for flood and drain media baseAquaponics. Floating raft use on DWC type of aquaponics, yes floating raft do tends to limit the type of plants can be grown, these are popular in commercial venture where single plant type is more economical. For home enthusiast, I recommend media base as initial setup, what style of setup it all then depend on how big your intention. Recommend you check out few other site and forum to get the whole picture before deciding on what to use or set up. I'm new to this. Why do we even need a siphon for grow bed ?. 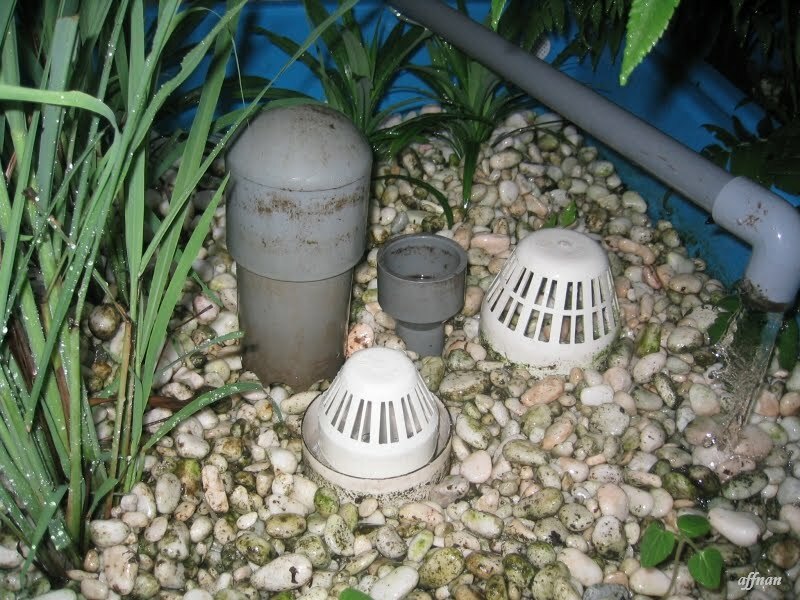 Why cant we use a overflow pipe from the grow bed directly into the fish tank. This will create constant water available to the roots, perhaps plants do not like that - is this the reason ?. If we need to drain the water off of grow bed every so often with a siphon, then what is the optimum cycle time for growbed full of water and no water ? Why do we even need a siphon for grow bed ?. Answer : It's not needed if you can find another way to do the flood and drain cycle, or you decide to use the continuous flood method or the timed flood and drain method. 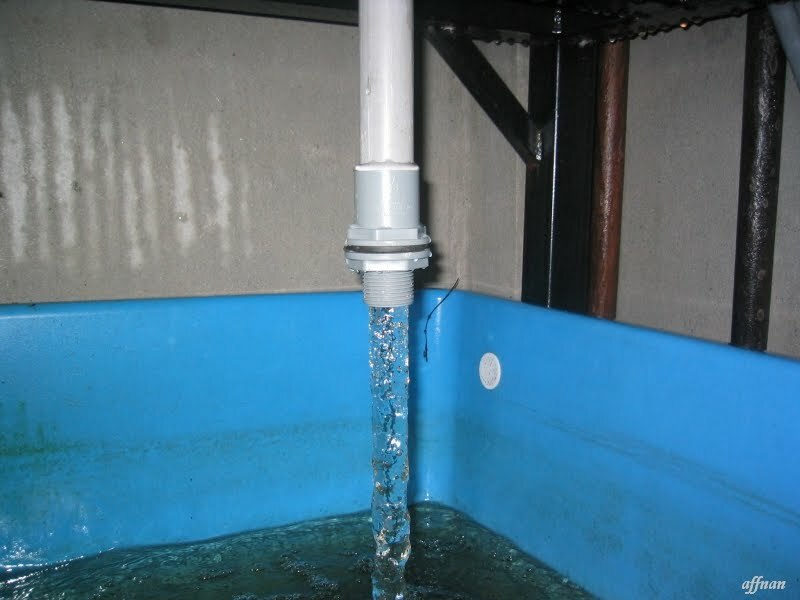 Why cant we use a overflow pipe from the grow bed directly into the fish tank. This will create constant water available to the roots, perhaps plants do not like that - is this the reason ? If we need to drain the water off of grow bed every so often with a siphon, then what is the optimum cycle time for growbed full of water and no water ? Answer : Optimum cycle is cycling 4 time the volume of total water available in your system in an hour. Hi Affnan, I made my siphon using 13mm standpipe and reducer from 20mm to 13mm sometimes running well but often did not reset.. my growth bed is 90x64x26 and fish tank is 150 litres. 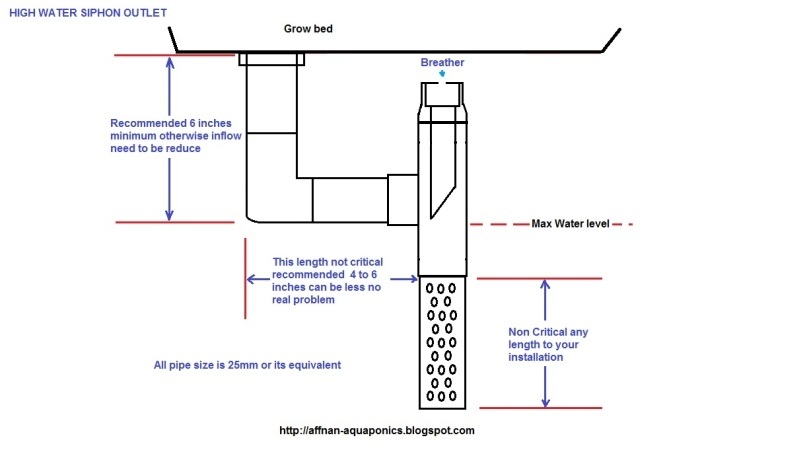 I need slower water debit from tank to growth bed but faster water drain from grom bed to fish tank... can you give me suggestion? my pump debit is 600 litres/hours. 13mm standpipe siphon is very small, you will need to divert excess water by dividing and restricting water flow. That size of stand pipe is recommended about 300 ~ 400 liter/hour. i want to ask about the leak hole..
for what purpose we add the leak hole to your ssiphon? It is only for pump off operation at night, it's optional. aslmlkm afnan.. can you make one of this bell for me.. I will buy it from you. 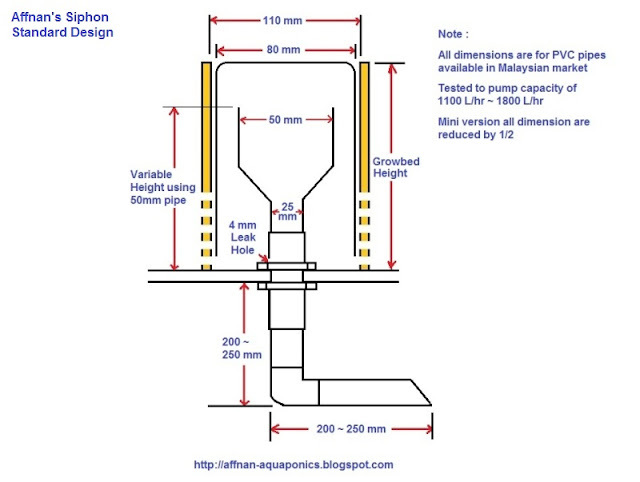 I am studying at UTM and I don't have resources to build this siphon.. Leak hole is ready? or need to drill?? You will need to drill, recommended 4 mm, but this is optional not a must have feature. If you practice pump off during night time or few hours at a time then it is best to have this hole otherwise not required. Hi, thanks for all the work you put into this!! It is a great source of knowledge on bell siphons! I have one question left: cam you please explain me what the function of the small 4mm leak hole at the bottom of the stand pipe is? That leak hole is for water drain, this is required id you are operating the water pump during daylight only. It is to drain water during pump off operation. I you operate pump 24/7 then this hole is not significant. My smaller siphon no longer has this hole due to I am operating the pump 24/7. Assalamualaikum, i just beginning to setup my 1st aquaponic set. is it good to drain to the maximum all the water? Thank you for the information. asking for halal of the knowledge you give.